In my previous post I had written about how I miss few things in Canada and how I was a little disappointed. I think I have to take back my words now, because I have discovered few amazing things here. I’m sure I’m going to find more interesting stuff once I start exploring the place. Last week we had been to a mall and found a store called Bulk Barn. From where I was looking I was able to see only the name of the store in big letters and big packets of bird food. With the name and the bird food I thought it was some pet store where they were selling pet supplies in bulk and was thinking of skipping it. But I turned back again and marched towards the store and I’m so glad I did it or else I would have missed something very amazing. It’s a grocery store where supplies are sold in bulk and not in ready to go packs, so you can decide to buy how much you want. Also they have an unbelievable selection of specialty flours/grains, baking supplies, nuts, candies and many more. I felt like a kid in a candy store. I was able to find a lot of stuff which was not easily accessible to me in US as well. Another exciting find was the community center in our area. It’s just 7 minutes walk from our home. It has a decent size library (not much in the cooking section but a lot of materials for my son) and also a fitness center with reasonable prices. There are a couple of parks and walking trails also nearby. I’m loving it here! Now coming to today’s recipe, while grocery shopping last week I found oat bran and wheat bran in the store. Back in US these and similar items were available but was either costly or I had to make a special trip to the health food store. So I did not get a chance to use oat bran. When I saw it here I immediately grabbed a pack of each. I didn’t know what I was going to do but bought it anyway. Here I have to mention something, I’m a shopaholic. Not that I buy countless dresses and shoes (I used to be one back in India) but I love to buy grocery supplies and cookbooks. 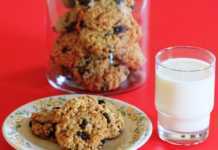 While browsing the web for recipes using oat bran I found this recipe. I have tweaked it little bit to suit our taste. 15 Mins 10 Mins 44 Cookies. 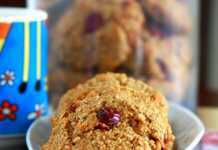 Don’t let the name scare you away because these super healthy oat bran cookies without eggs will be a hit even with the kids. This cookie recipe is a proof that healthy and tasty doesn’t have to be mutually exclusive. Wholesome cookies made with white whole wheat flour, oat bran and flax-seed meal, doesn’t get any better. Preheat oven to 350F for 15 minutes. Grease the baking sheet or line it with parchment paper. In a big bowl combine together the flours, bran, flax seed, baking powder, baking soda and raisins (if using) and set aside. In a medium bowl, blend together butter and sugars until creamy. Add applesauce and vanilla and mix until well blended. If you use an electric beater to mix the applesauce it may look curdled, but don’t worry. To the wet ingredients add the dry ingredients and mix well. Drop the dough by tablespoon on prepared baking sheets. Lightly spray the tablespoon with non stick spray, so that the dough will drop easily. Use a butter knife to scoop out the dough from the tablespoon. The baking time mentioned in the recipe is 8-10 minutes. The cookies look very even after 9 minutes but I removed them out anyway. After it cooled we tasted it and felt that it required further baking. So baked again for another 3 minutes. This time it had a nice golden brown color. Leave it in the baking sheet itself for a minute and then transfer it to a wire rack to cool completely. The earthy smell of white whole wheat flour was predominant when the cookies were consumed fresh (on the day of baking). But they tasted very good the second day. The smell was very mild. My son is enjoying the cookies very much, so I guess he doesn’t even smell anything different. I reduced the quantity of both the sugars considerably and even then felt it was quite sweet. So check the original recipe if you like your cookies very sweet. I also used 3/4th cup of raisins, which was optional in the original recipe. I’m not a cinnamon fan, so I used very little of it. I think the earthy smell of the whole wheat flour can be overcome by using considerable amount of cinnamon (about 1 teaspoon). If oat bran is not available, you could also use coarsely powdered quick cooking oats. Using non hydrogenated margarine or any vegan butter will make these cookies even more healthy by cutting back on saturated fat and cholesterol. Usually I bake the entire batch on the same day and the cookies vanish in no time. So this time I decided to freeze the dough. I baked only 20 cookies. Line a baking sheet with parchment paper and drop tablespoonful of the remaining dough onto the sheet. Cover it loosely with another parchment/wax paper and freeze it for an hour or until it is firm enough. 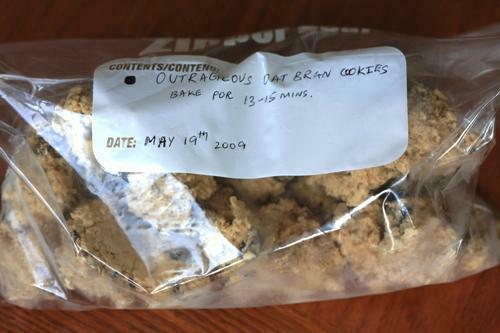 Then transfer the frozen cookie dough to a Ziploc bag and write down the name of the cookie and date when it was prepared and put it back in the freezer. I read that the dough keeps good anywhere between 1 month to 3 months. Thawing of the dough is not necessary while baking it. Just bake for additional 2-3 minutes. 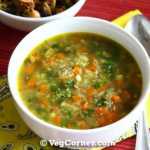 In this recipe it would be around 13-15 minutes. Update: I baked the frozen cookie dough and it was even better than the fresh ones. I baked it for 16 minutes at 350F, switched off the oven but kept the baking sheet in the oven itself for another 10 minutes. The cookies had a very nice golden brown color. They were crisp on the outside and soft in the middle. What is the cup size or measurement you use ? I have seen you have not mentioned in any of your recipe about the size of cup or of what ml the cup is, so thought to ask. This is standard US cup measurement Asheesh. My entire family loves these cookies. We made them two days in a row. I made on batch as is and one batch with coconut. The coconut gave it a great texture. We used all organic and vegan ingredients. Totally worth it. Maybe next time I’ll try making it with coconut oil to make them extra healthy. Thank you for this wonderful recipe. God’s peace my friends. 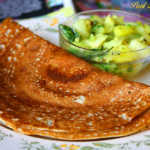 Hi Madhu , can I replace applesauce with egg . If yes how many ??? Just baked these today . 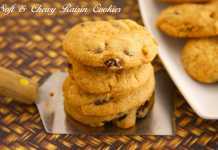 Firstly why I chose this recipe to other cookie recipes is there no egg replacer.. Somehow I don’t like it. What should I say : it tastes delicious or it smells so fresh or it has a perfect cookie texture or it looks so crunchy yet soft… Wow what can I say? This is the best cookie I have made & also the most flavorful & healthy cookie that I have ever ever tasted … So thank you. I did some little tweaks & it worked out well. Rest as given in the recipe. I am glad I found this & tried it too. Next time I will try to reduce the APF & use more healthy grain flours. 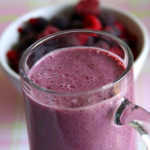 For all please do try this recipe not for the correctness but for the FLAVOUR .. Thanks for the detailed feedback, Sandhya. These are really really tasty!!! Def. gonna make them again! 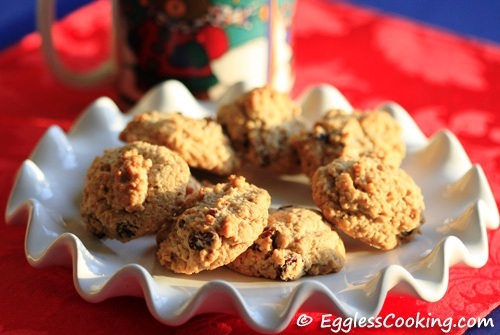 I am pregnant and googled eggless cookies (love to taste the dough and so does my daughter). We just made these and they are amazingly good. I used everything you called for, and would not change a thing! We topped them with a pecan to make them extra pretty. I needed to bake mine for 16 minutes (have an extra large gas oven). 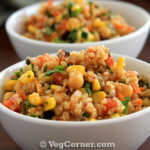 Anyways, I will be using your site for more yummy recipes and I’m glad I found you! Hi, dear Madhuram. I, too, love Bulk Barn. It is great for spices, too. I can buy 5 or 6 spices for less than $1, and due to the high turnover, they are very fresh. If you are near Toronto (I’m not too far away), there are some great Indian grocery stores and other wonderful Asian stores to buy hard-to-find items. These cookies look professional. I have never used oats but have been wanting to try it for a long time now. Have stock of both oat bran and wheat bran. That’s probably a sign. Btw, I’ve found that using a little more of flax seeds tends to give a discernible taste and smell. The site from which I tried these had named it Outrageous and I went with it thinking that it would create a curiosity and it did!